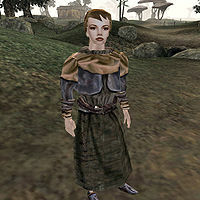 Leles Birian is a Breton mage who can be found by the road in the Ascadian Isles region. To find her, go due east on the road from Piernette's Farmhouse. She is also due west of Dirara's Farmhouse, and north-northwest of a small unnamed farmhouse owned by Travelling-New-Woman. Leles is the Master trainer for Destruction, and also offers high-level training in Mysticism and Restoration, as well as a selection of mostly high-level spells (oddly enough, none of them in Destruction). She can also make custom spells for you, and is one of the few non-faction-affiliated people to offer this service.